I've been thinking about my Etsy shop and some other things that I enjoy making to include there. I decided that maybe a few wrist cuffs might be a fun addition...so, I started making one with a new idea for button closures - rather than a snap. Ditch that idea...the snaps are a better solution (and easier, I might argue). Since I hadn't created one for myself - this one is at home on my wrist as I type. I like it!! I can't wait to wear it and see how it weathers time. See if the gals comment on it - or if those cheerleaders "boo" this idea. The colors are a bit wonky in the photo. The maroons are more bold, rather than pink-ish. I did another raw edge applique. I'm not sure why I like raw edges better than formal appliqued ones, but I do like the idea of the piece evolving with time, fraying a bit and becoming a bit more cultured in the process. I do, however, think it's time that I explore some of my fancy machine stitches instead of the raw edges. We'll see what happens. I'm ready to proceed with a few more, with future ambitions for the Etsy shop. Long ago - maybe a year? 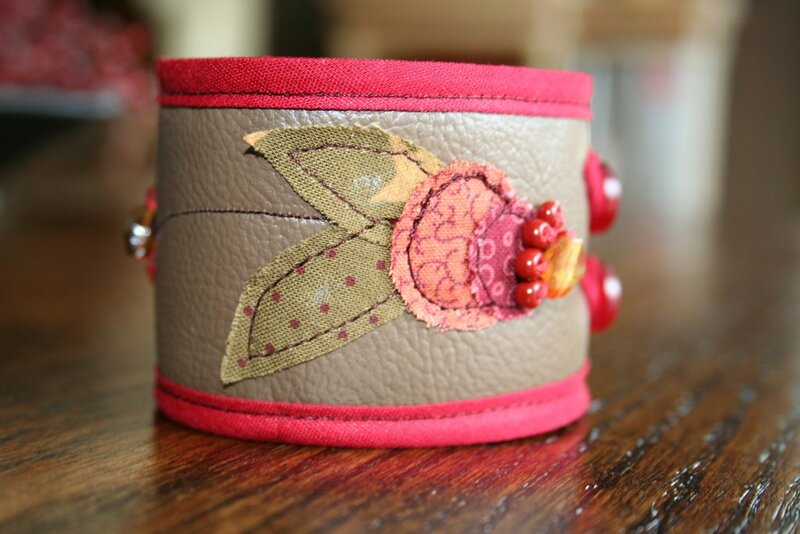 - I entered the Backtack II Swap and made friends with my swap mate, Paula Foschia. Paula and I chatted back and forth during the swap even though it was expressly against the rules... This is my Christmas package. Long story, but after the Backtack package I mailed her appeared lost in the mail for several months (but eventually arrived), we decided to swap another set of goodies around X-mas time. I sent my parcel, which arrived way before my backtack package did, and Paula, ahem, did not get hers mailed off. Paula has relocated from Brazil to the United States to go to school and before she left - she mailed this package to me. Of course there was some drama involved when Paula made it to the United States long before the package did..but it's here now!! Thanks Paula!! 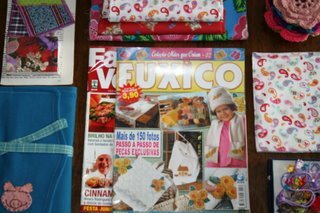 Kenzie loved all the candies and hair ties..and I can't wait to try some projects from the magazines and fabrics. It's quite an assortment of stuffs, and I shall sign off to go sort through all the lovelies..yet again. Here's wishing her the best of luck at law school in New York! 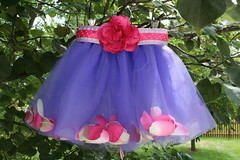 Due to listing one of my little princess skirts on Ebay and finding the reaction to be not so overwhelmingly successful (it's on its final day, and there are no bids, albeit a few "watchers") I've gone forth with opening an etsy shop to make my first attempt at selling handmade goods. 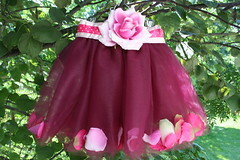 I'm glad I didn't list all three skirts, or I'd be really depressed at the investment in each listing! This was my first sale over at my Etsy shop. Visit my shop by clicking "items for sale" over at the right. 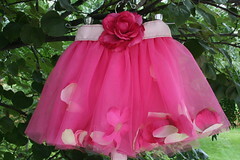 This precious little tutu is currently for sale at my etsy shop. This little piece is one that I've enjoyed. It's hard to photograph, especially since it's 4' by 1' and the unfinished sides are all shaggy. But, it's had several intentions. First, it was to be a growth chart, but somehow it seems to complicated to finish in that matter - unless I had it scanned/printed elsewhere and added the measurement elements that way. Then, I decided it should just be a wall art piece...but I'm still unclear as to how I'll finish it. First, it'll get a good ironing (duh), and then either I will encase the sides in a binding and add a dowel and some ribbon for hanging...or I'll have it framed in a white frame with a colorful matte (probably red) border. 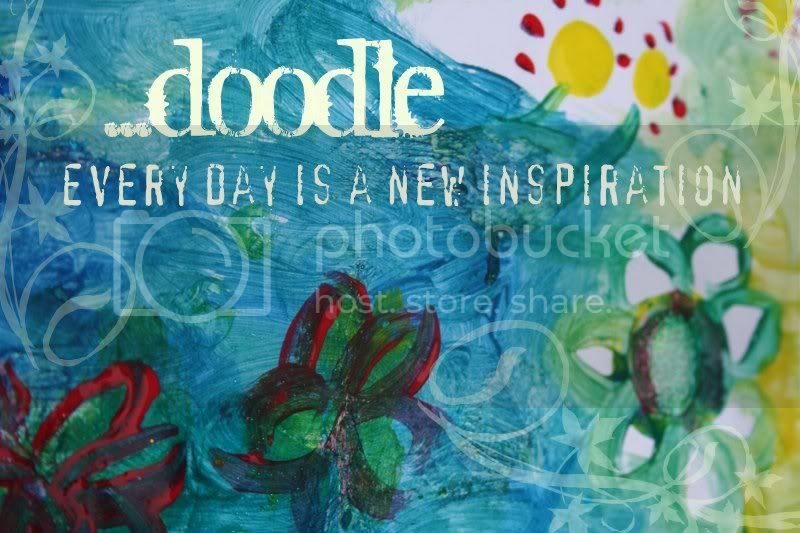 It's meant for Kenzie's room which is taking on a very spirited Oilily feel. I happen to like that, however, I don't know if my husband feels that's a good thing. 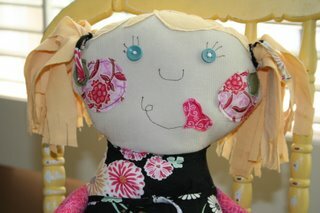 This is doll #1, to be gifted to one of my neices as a birthday gift. 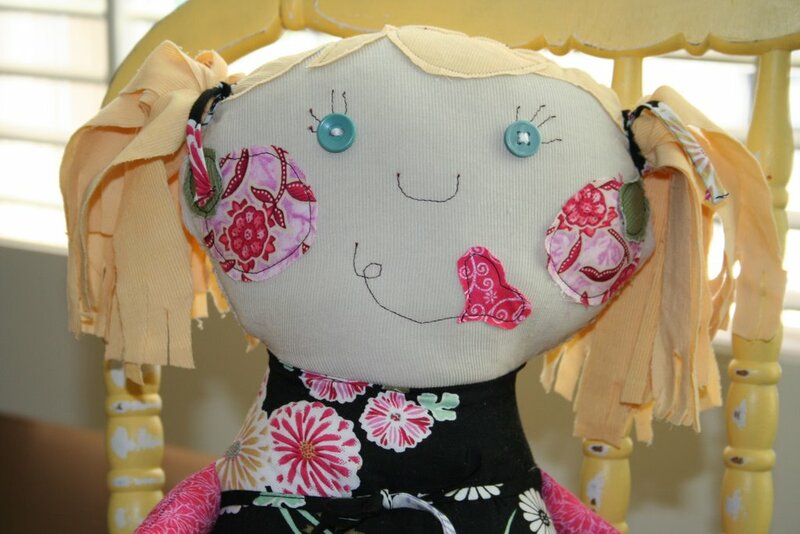 As was mentioned yesterday, I'd created this doll in a way that resulted in a bit of a "pinhead" appearance. After some reconstructive surgery, some piggies were added superficially to give her head a bit more of a presence on the large body. She also received a bit of a cheek liposuction, as they were a bit wonky and too large for her face. All is better now, yet I'm still not claiming her as my favorite. In showing these gals to my neighbor friends, we all agree that the Kenzalina doll has a charm to her that the others are lacking. I just can't figure out what I'm doing wrong - aside from my passion for creation always wanes with reproductions. I'm just not a crafter that can do the same thing over..and over...and.... I think it's the color schemes. The first doll was more colorful, then these last two. Two more to go. And then birthday extravaganza for 2006 will be complete. 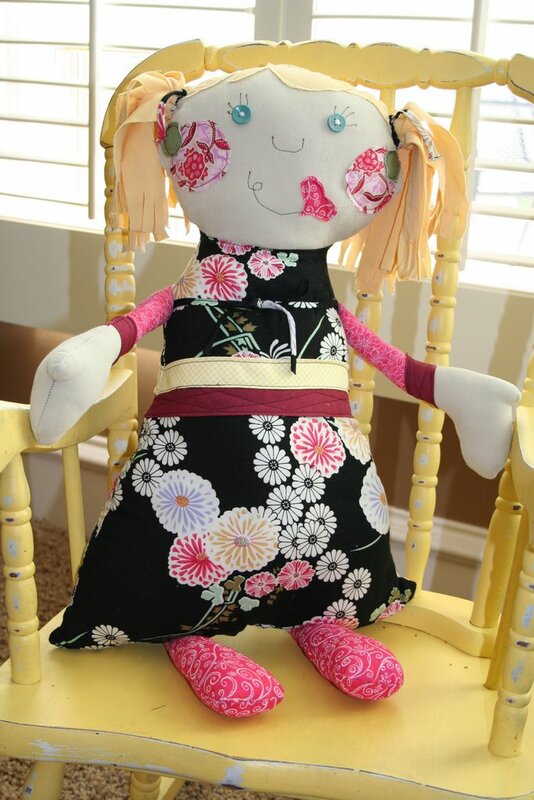 **this doll was also created using my own pattern - which idolizes Susan of Joybucket.org's style.